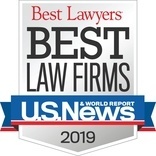 CLL continued to be ranked for 2019 as a National Tier 1 firm in the practice areas of Copyright Law, Information Technology Law and Trademark Law; National Tier 2 for Intellectual Property Litigation; and National Tier 3 for Patent Litigation. In the Metropolitan listings, CLL continued to be ranked for 2019 in New York City Tier 1 for Copyright Law, Information Technology Law, Intellectual Property Litigation and Trademark Law; New York City Tier 2 for Patent Litigation; and New York City Tier 3 for Commercial Litigation. See more Honors & Rankings.